Producing assets and finding a visual direction for conferences or big events such as WordCamp can be a tedious task and represent a lot of work for designers. From not knowing where to start, thinking about every asset that’s needed, browsing the web to find out standard dimensions and looking for visual references, the challenges arise! So, in order to facilitate and ensure an enjoyable workflow, I created this **fully customizable, free and open source design kit**. With this folder in hand, the designers get access to tangible inspiration, functional templates, and professional mockups. More than one could ask for! Made for designers and intended for the end-users, this guide should also be a source of motivation to generating brilliant visuals that prompt excitement towards the attendees, sponsors, volunteers, organizers, speakers and anyone involved in the event. And because the beauty of customization lives in its opportunity for a unique flavor, I myself took great influence from my surroundings as I was building the template. 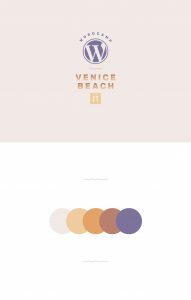 In fact, you’ll notice a combination of the Silicon beach tech scene (through the icons, the generous white spaces, and the sans serif font) and the romantic colors of Venice Beach sunsets (via the compound colors ranging from purple to orange). I should have added in the post about volunteers/paid volunteers that we desperately need design help as well. 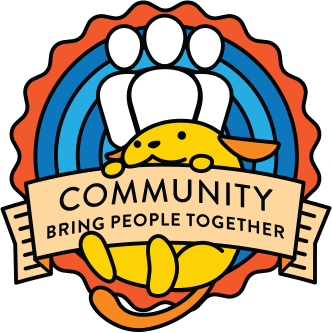 If you’re a designer who wants to get involved (working on design stuff for the team overall and/or helping local communities that don’t have a strong designer on their event team), let me know! Same deal, a little or a lot, every bit helps.